Chelsea manager Jose Mourinho will not appeal against his stadium ban for Saturday's league game at Stoke. The Football Association punished the 52-year-old for his behaviour towards the match officials during Chelsea's 2-1 defeat at West Ham on 24 October. Mourinho cannot enter the Britannia Stadium but will travel with the team and be responsible for substitutions. "I have decided to give up," said Mourinho. "It is stupid to fight a fight you know you are going to lose." Asked how he felt about the stadium ban and having to watch the game somewhere else, he said: "You can imagine that it's not easy. You can imagine how I feel. "I have no plans to watch. Maybe I sit in the street corner with my iPad. Maybe I don't even watch the game. Maybe, live scores? Results?" Mourinho's punishment also included a £40,000 fine and is for a misconduct charge over his language and behaviour in the defeat by the Hammers. His side were then knocked out of the League Cup on penalties at Stoke. Chelsea have since been beaten at home by Liverpool, suffering a sixth loss in 11 Premier League games this season to leave them 15th. 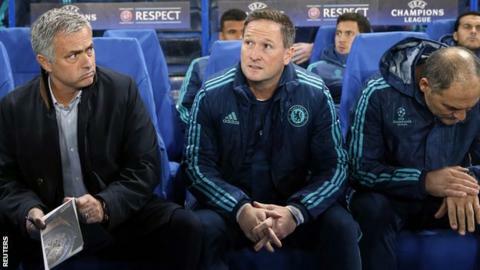 However, the Stamford Bridge side did beat Dynamo Kiev 2-1 in the Champions League on Wednesday. In a separate disciplinary action, Mourinho has had his appeal against a £50,000 fine and a suspended one-game stadium ban dismissed by the FA. He believes his stadium ban could set a precedent for future cases. "This stadium ban is connected to words, to complaints," he said. "I can imagine that in the future we are going to have lots of managers with stadium bans, because the stadium bans should be related to something really serious." Who's in that laundry basket? Mourinho was asked about allegations he hid in a laundry basket for the first leg of a Champions League quarter-final tie against Bayern Munich at Stamford Bridge in 2005 as it was claimed he circumnavigated a Uefa two-game touchline ban. He refused to confirm or deny such an episode, but insisted he was not tempted to do something similar at Stoke. "I don't anticipate Mourinho sneaking in with a laundry basket again," said Stoke manager Mark Hughes. "I'm not sure if it's for us or the FA to monitor him, because who's to know whether he'll have a phone to his ear. "Unless an FA official is sat on Jose's knee I'm not sure if anyone knows if he'll be here."